Join over 3,000 families, banish toddler sleep time battles, and regain control of your day and sanity…starting right now! Toddlerhood. A whole new ballgame! Toddlers come with a whole new batch of sleep problems. (You may have noticed!) She may be waking too early or need you next to her to fall asleep. His nap is likely getting shorter and just as you put him down at night, he pops out of the bed. These changes, along with your toddler’s newfound voice and attitude, are probably making bedtime (and the rest of the day) a lot more challenging! A good night’s sleep for you both may be turning into a distant memory… and fast! Thought your child’s sleep problems were a thing of the past? Whether you thought you licked your baby’s sleep problems, or hoped your baby would simply outgrow them, you’re like many parents. It can be downright scary and difficult to tackle sleep issues when you’re confused about what to do. When I was a new mom with a new baby, I thought my son would do what the babies of practically all my friends seemed to do so easily – sleep like a baby. Yeah, right! No matter what I did or didn’t do, he just wouldn’t go to sleep. Or when he did, it took forever for me to get him down — and his sleep was still short and fitful. I wanted to help him so much, as I know you do. I was successful in helping my son sleep, but being the difficult sleeper that he was, he came up with new sleep issues as he grew and challenged me to help him back to sleep in a healthy way. After countless hours of research, I learned what it takes and now I can help you. 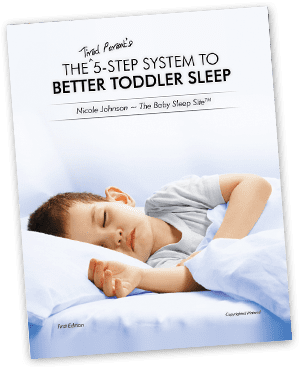 Toddler sleep success is just a click away – I personally guarantee you a toddler who sleeps better — or your money back! Toddler sleep relief starts today! I’m willing to bet that if you’re reading this, your toddler isn’t sleeping “like a baby.” I promise you, there is relief at hand, and you can start getting it today! In my e-book, The Tired Parent’s 5-Step System to Better Toddler Sleep, I give you a complete toolkit of strategies, advice, sample schedules, and sleep logs to get your toddler to love bedtime – so you can get back in control and you can both get the sleep you need. With our Gold Package, you’ll get instant access to The Tired Parent’s 5-Step System to Better Toddler Sleep , several awesome bonus resources, and an Express Sleep Plan®. It takes just a few minutes to start gaining control of your toddler’s sleep! I’ve done all the research, so you don’t have to. My name is Nicole Johnson, and I am a married mother of two wonderful boys and the Baby/ Toddler Sleep Coach and Owner of The Baby Sleep Site™. Driven by my own frustration with a baby who slept fitfully, if at all, I began to research the key literature and scientific reports on how babies sleep. It’s what I learned from my months of research that I now share as an expert in sleep methods, scheduling routines, baby development needs and more. I overcame my son’s sleeping issues in a way that matched my own parenting style, and knew it was my mission to help other tired parents “find their child’s sleep” – and yes, I can help you find yours. How do I know when to transition from two naps to one, and then to none? Should I let my toddler cry-it-out or not – and how will it affect our relationship? Why does my toddler STILL wake-up in the middle of the night and how can I effectively put her back to sleep? What’s the difference between night terrors and nightmares and what do I do during them? Which sleep coaching method is the best match for my toddler and my parenting style? How do I break my toddler’s dependence on me to fall asleep? What can I do to get my early riser to wake after the sun comes up – so I can sleep in? How do I switch my toddler out of a crib to a big bed? Optional Express Sleep Plan® (Gold Package Purchasers Only) – receive a customized plan specific to your family’s history, your family’s philosophies, and your specific goals. The Express Sleep Plan® includes direction, a recommended sleep coaching method based on your philosophy, and a day-by-day action plan that is customized for you and your family – all in one, brief easy-to-read, budget-friendly package! You will get the rest you both need – GUARANTEED! There is no “one size fits all” when it comes to what will work for you and your baby. No matter what your child’s temperament or age … whether you’re stay-at-home, working full-time or part-time, or employing a nanny or daycare – I’ve designed the techniques in The Tired Parent’s 5-Step System to Better Toddler Sleep to be customizable and flexible, so they will work for your family – or you get your money back. That’s right – if you are not completely satisfied with your e-Book package materials, you may request a full refund within 30 days of your purchase date. You also have the option to personally consult with a Baby Sleep Site sleep consultant one-on-one with our add-on packages, so we can work with you to develop your very own personalized sleep program – at a cost that’s less than many sleep experts’ books. 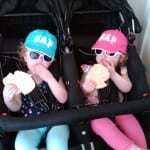 Join over 3,000 families and banish the sleepless toddler beast forever! Buy a Gold Package, and get your instantly-downloadable e-Book, bonus materials, and your Express Sleep Plan®. Sleeping toddler. Rested parents. Priceless. Spare yourself the countless hours of reading and guesswork that I had to go through. Let me teach you what I’ve learned so you and your child can enjoy a lifetime of healthy sleep habits. time to figure out game plans for each developmental milestone your toddler achieves. That is an estimated 48 hours or more of your time. If you paid yourself even just $8 per hour, that is $384 plus the cost of the books (over $400 total!). Not only will this e-Book save you time and money, it will give you the tools you need to help your baby nap better and longer, and you can’t put a price on that. The Tired Parent’s 5-Step System to Better Toddler Sleep has done the work for you, so you can put your focus back on other things with your baby other than sleep! As any mom who’s been there knows, getting the rest you both need is more precious than gold. I got my control back and you can, too. Just pick the Sleeping Success package that works for you. SPRING SAVINGS — ENDS 4/30! P.S. You don’t need to stress, cry or clench your teeth over naps any more. Purchase your e-Book package today, and in no time at all, both you and your baby will be getting the healthy sleep you both need. Remember, your satisfaction is fully guaranteed! You have nothing to lose (except for those nasty sleepy time tears and fears – and who wouldn’t be glad to be done with those)! Give your toddler the best gift in the world – a happy, confident and rested mommy or daddy or both! Purchase your e-Book package today!